As much as I hate to say it, it’s impossible to see everything. That said we had to skip a few of the stops we wanted to make in Myanmar. So, our next stop after Bagan was the famous Lake Inle. The beauty of Lake Inle, in my opinion, comes not from the lake itself, rather the people who have established their lives there. Several different tribes live in numerous floating villages on the lake. They’ve built their homes on islands, stilts, and in boats. They fish and cultivate a number of crops on floating gardens. More recently they’ve also seen that tourism can earn a pretty penny and are building hotels right and left. To explore the lake you need to take a boat tour. We were lucky and ended up having the boat to ourselves! 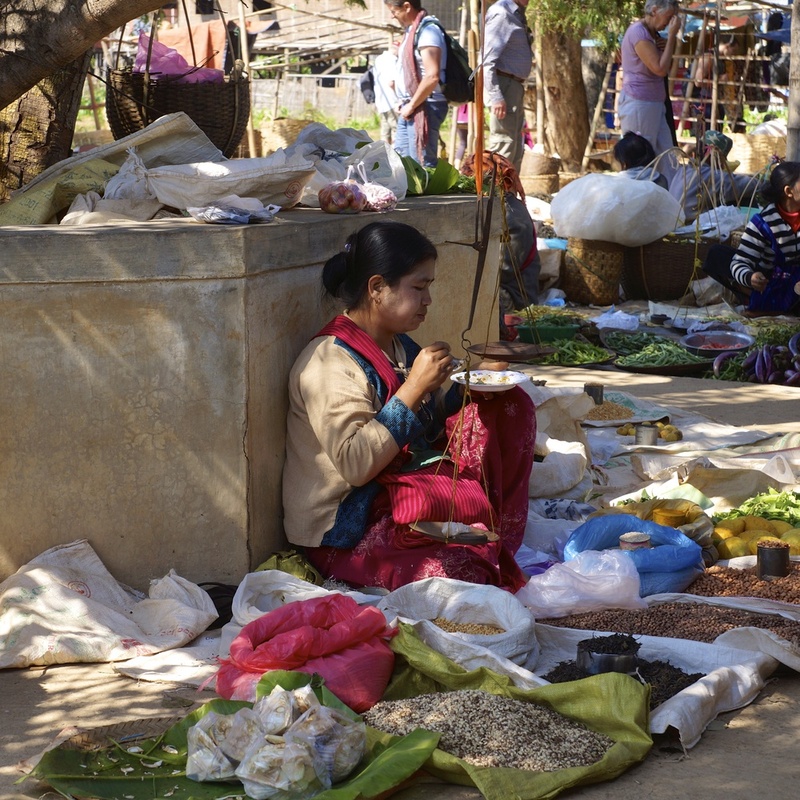 The tour of the lake was beautiful, but it’s clear that tourism has gotten the best of Lake Inle since there is a convenient market attached to just about everything, including the temples. One of the first things we saw from the boat were traditional fishermen. 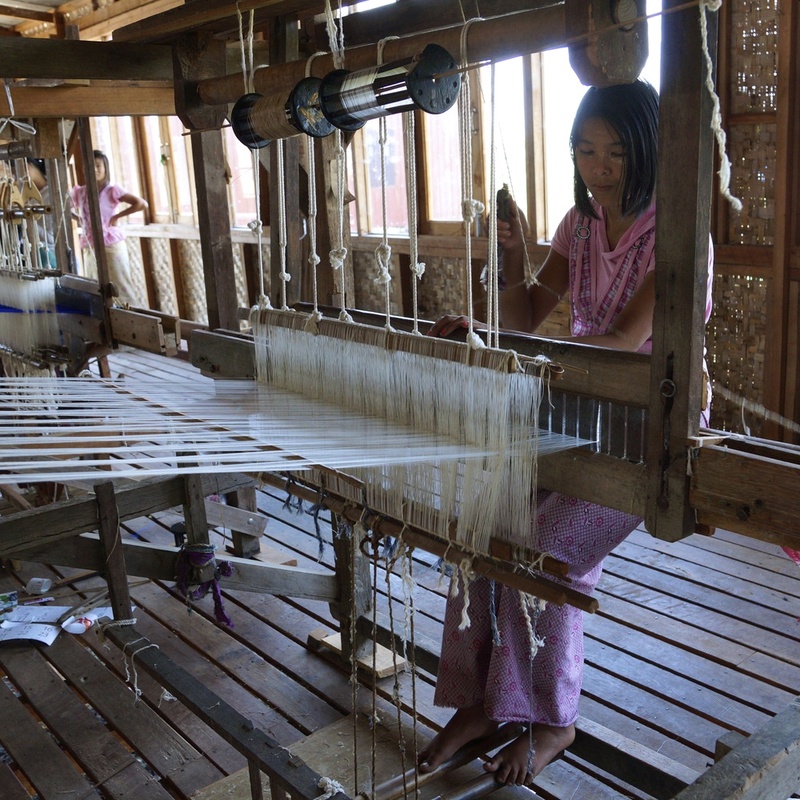 The Intha are members of an ethnic group that live on and around Lake Inle. They are known for the leg rowing technique they began using long ago. Today, the leg rowing technique is still used among traditional fishermen. The technique allows the fishermen to see beyond the weeds that grow to the surface of the lake. The basket they carry has a spear sticking through the top of the net allowing them to stir the weeds and capture fish more frequently. Although there are a lot of traditional fishermen who still make a living on the lake, they’ve also been joined by a number of posers who target tourist boats and attach themselves to the boat until you pay them for having taken their picture. Different places we stopped on the boat tour included weaving factories, local jewelers, temples, and the floating market. I think the tour is what you make of it. We weren’t rushed at any of the stops and were given the time we pleased. If you choose to wander away from the shops, you have an opportunity to see daily life on the lake. One of my favorite parts of the boat tour was when we floated through an area that wasn’t actually a “stop.” We drifted in between gardens and watched the farmers pulling different floating beds together all while balancing in their flat-bottomed skiffs. I also enjoyed the floating market. If you make it beyond the stalls selling mass-produced trinkets, there are stalls filled with hand made pieces by local artisans. Continuing a bit further there was the local market filled with fresh fruits, vegetables, fish and flowers. Another stop on the lake tour, we visited beautiful ruins. 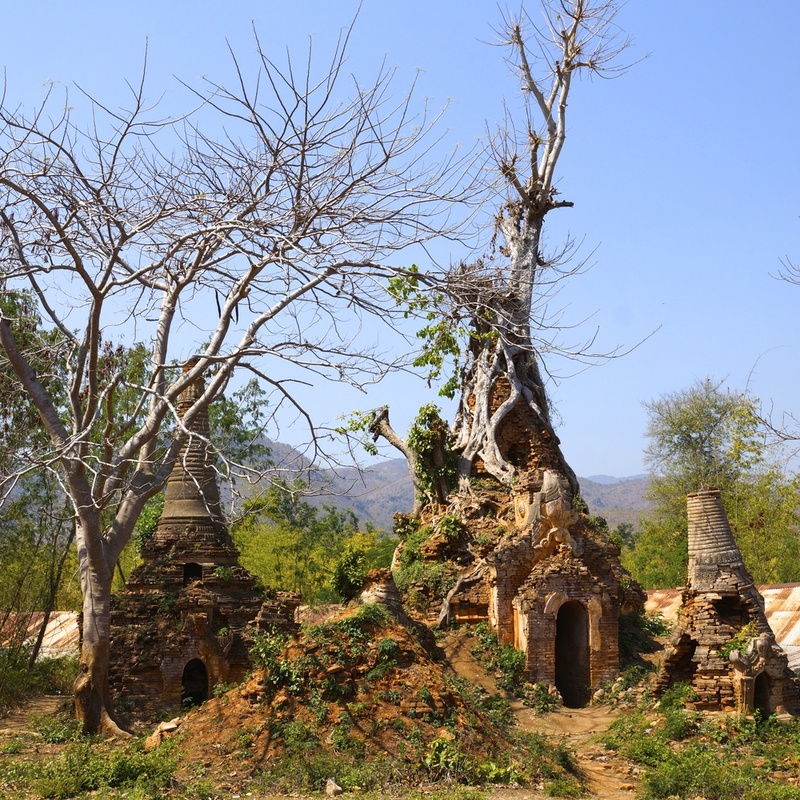 After seeing Bagan, I was a bit "templed out," but I adored seeing these old temples and pagodas. Trees had taken over some, others were falling apart, and others were in very good condition (taking into account how long they've been around for). We stayed in Nyaung Shwe, located on a canal a few kilometers North of the actual lake and decided to spend an extra day to explore the surrounding area of the lake. We took a tuk-tuk to one of two vineyards in Myanmar. A winery was the last place I expected to find myself in Myanmar, but it was a pleasant surprise (thanks for the tip, Theresa)! The winery was at the top of the mountain and the view overlooking the vineyards reminded me a lot of the South of France. We did a wine tasting (2,000 kyat/ 2 USD) and the wine was… well, interesting. We didn’t give up there, though. We tried the cabernet sauvignon and were pleasantly surprised. The sunset over the lake was worth staying for, too! The owner at the guesthouse we stayed at in Nyaung Shwe was part of the reason I loved our stay in Nyaung Shwe/Lake Inle so much. He reminded me that the first impressions I had of Burmese people were spot on – he was kind hearted and his joy was contagious. Stay tuned for my post about accommodation in Myanmar to learn more about his guesthouse, Win Nyuant Inn. Getting back to Thailand was slightly more complicated than we originally anticipated. There are certain regions, also called “troubled regions,” in Myanmar that are not open to tourists. The Shan State (border with Northern Thailand) is one of these regions; we flew from from Heho to Tachileik, Myanmar to get across the region and crossed back into Thailand by foot at the Mae Sai border. Crossing the border was like walking a narrow line between two different worlds. On the Myanmar side of the bridge it was quiet, dark (limited street lights), and there was an intense military presence. Upon arriving on the Thai side of the border, the streets were bright and filled with decorations, there was a night market and a concert; it was like we were walking into a big party. I was quickly reminded that although the two countries share a border, they really are two different worlds. As I reflect on the time I spent in Myanmar I’m grateful to have seen the country now – as it’s changing. I’m curious as to how the country will continue to develop and it’s a place I would love to return to in a number of years. I can only hope Burmese hospitality remains the same, as it is what sets the country apart from others. Thank you for the memories, Myanmar!